Water monitoring is increasingly becoming a challenge for energy companies, governments and other industry stakeholders trying to find smarter ways to automate water meter readings, monitor water levels, detect leaks and manage water quality. Decrease reliance on manual systems that can be inaccurate, untimely and costly. Detect leaks in the distribution system to reduce losses due to non-revenue water. Reduce production costs such as pumping rates and raw water treatment costs. Reduce fleet costs associated with site visits and manual water level checks. A multi-national mining corporation runs the longest continually operating sand mine in the far reaches of Australia, outside of cellular range. As part of operations, regular measurement of water quality and levels of bores is required to meet government regulations and satisfy environmental standards. Because of the remoteness, it is both expensive and dangerous to send workers in to track the disposal of contaminated water, riverbed degradation, bank erosion, water table levels, and stability of channel and groundwater systems as well as monitor the sand mining methods. The mining company turned to Pacific Data Systems to deliver a comprehensive, end-to-end solution capable of collecting, processing and transmitting the required field data to a central location without human intervention at the mining site. The solution incorporates high-accuracy water sensors, solar technology and a web-based interface using ORBCOMM’s satellite technology and the IsatData Pro satellite network. The operation center now has access to historical and real-time data any time, which enables greater operational visibility and provides information required for planning strategies. The automation of readings also enables the mining company to reduce the number of field visits and gain significant payroll savings. The company is also improving worker safety, meeting occupational and public safety protocols, and minimizing insurance costs including those associated with employee liability claims. Brazil is experiencing one of the worst droughts in its history. Not only are millions of residents facing daily water shutoffs, they are also experiencing rolling blackouts as there is not enough water for the country’s hydroelectric system to meet electricity demands. Given the increased awareness of diminishing water levels and the need to more closely monitor this vital resource, the country is investing in more telemetry infrastructure to monitor its waterways. 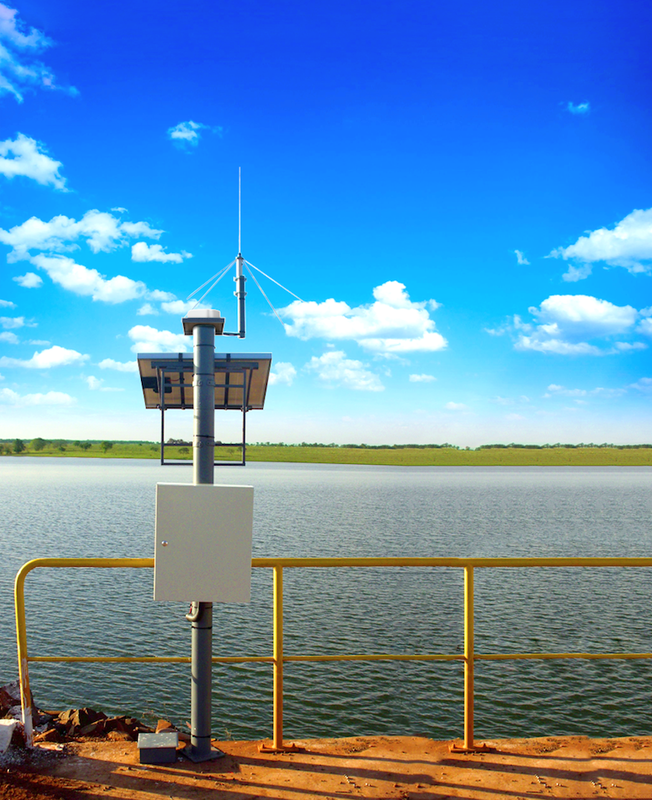 Brazilian water monitoring company Construserv Group turned to satellite to help increase the acquisition of information from remote water monitoring stations around waterways. Using the OnixBridge, an IsatData Pro satellite terminal offered by Brazilian ORBCOMM Solution Provider OnixSat, Construserv is using the satellite device as a “bridge” between remote equipment and the customer’s operations center to transmit data received via the serial port of the device. The result is faster, more economical and reliable data collection. Sensor-based monitoring remains the technology of choice for many organizations looking for water monitoring in local areas. Bentek Systems implemented a real-time, satellite-based solution for an energy company that needed to monitor aquifer levels from its remote groundwater monitoring wells. The energy company used to charter a helicopter every three to six months to manually check water level information collected by data loggers. Bentek offered the energy company a solution that not only eliminated the need for field personnel to manually collect data, it also provided data in real-time and reduced transportation and labor costs. The solution periodically measures water levels and sends the data four times a day using the IsatData Pro satellite M2M service to a web-based application. The benefits include reduced site visits, equipment uptime notifications, and real-time accessibility to data so that the energy company can quickly react to sudden or unexpected changes in water levels. Contact us to learn more about smarter water management using satellite monitoring technology.